Last week we examined Wyoming state spending as reported in the Census Bureau's state government spending database. Today, we take a look at another major source of state spending data: the annual State Expenditure Report by the National Association of State Budget Officers. The two statistics producers report on the same variables - state spending - but there are enough differences between them to warrant an initial methodological note. First, though: why do we even use out-of-state sources to understand state spending in Wyoming? There are two reasons for this. The first is, hopefully, obvious: since both the Census and NASBO produce statistics on state spending under a state-neutral methodology, their databases lend themselves conveniently to interstate comparisons. To try to do such comparisons based on the budget and spending reports from each individual state is to cross the river in search of water. Secondly, the Wyoming state finances are not easily tracked using the state's own sources. We will take a closer look at that next week; perhaps the most pressing problem is that we do not have an adequate audit function that compares actual state spending to what was budgeted - item by item. This happens to be an issue I have highlighted constantly for the almost ten years I have lived here in Wyoming. Many other states have much better systems on this matter than we do; a real transparency reform would be a nice, first start on improving the reporting of state expenditures. How, then, do the Census Bureau and NASBO differ in their approaches to state expenditure statistics? The question is valid, as the two report different numbers for the same year; for example, according to the Census Bureau, in 2016 the Wyoming state government spent $6.45 billion in total, while NASBO says we only spent $5.1 billion. How can we explain the difference? The main difference lies in the reporting methodologies. The Census Bureau does a highly detailed survey, to which states are obligated to respond - and accurately - or else they will be lying to a federal government agency. This alone vouches for a high level of accuracy in their reporting. Furthermore, the level of detail in the Census data is such that it takes them 20 months to process the raw data, once the collection period is complete. Alas, they have just released their database for 2016. At NASBO, they use less rigorous methods, with only one data collection point and entirely voluntary participation. They also concentrate instead on aggregate numbers for only a small set of categories. They do, for example, not break up health care spending to the detail where we can see hospital expenditures; the closest we get is "Medicaid", which obviously only accounts for part of the outlays in that category. This gives the analytical advantage to the Census Bureau. The upside with the NASBO state expenditure report is that it gives us an early idea of trends in spending; they have already published estimates of spending numbers for the 2018 fiscal year. They also break down federal funds by the programs they track, including Medicaid. There is one more difference that is worth keeping in mind. Data on state spending can be collected in different formats, such as at the point of legislative appropriations (the budget), the point of agency approval (the annual start of a spending program) or ex post facto. The last collection point means, plain and simple, an audit of how much money was actually spent during the given period of time (such as a fiscal year). Since Census data is entirely ex post facto, it is bound to be the most reliable in terms of what money was actually spent during a fiscal year. This does not mean the NASBO database is not reliable; under normal circumstances, permanent spending programs such as K-12 or Medicaid should not differ much between agency approval and ex-post reporting. If there are extraordinary cuts or increases in spending, the reporting method can make a meaningful difference. More likely, differences between Census and NASBO numbers for the same fiscal year can simply be a matter of variations in discretionary spending. This is especially relevant for capital outlays. Given the large volume of such spending in our state spending, and the discrepancies in timing of the different "data points" for state spending, this likely explains the aforementioned difference between the two databases for fiscal year 2016. A look at NASBO numbers for 2015 and 2016 reinforces this impression: their reported total amount for 2015 is $8.8 billion, slotting the Census number for 2016 in between NASBO's 2015 and 2016 numbers. If some capital spending for 2015 showed up as ex-post reported for 2016, then Census would include that as outlays for 2016. The drop of almost $3.1 billion in "Other" spending is not broken down into detail in the NASBO database, but it is very likely attributable to capital outlays. Wyoming has a habit of reporting those under "Other" spending, where many other states use the separate, fourth column called "Capital" and provided in the NASBO spending survey. The General Fund is less than half, but also seems to exhibit a little bit of a biennial cycle. Although there is no clear trend, on occasion the legislature appears to have reduced the General Fund in budget sessions (even years) only to grow spending again in general sessions (odd years). This is visible in 2009, 2013 and 2015. It will be interesting to see what happens in the 2019 general session. Federal Funds, which pay for a variety of - for example Medicaid, Transportation, Public Assistance and a small but increasing share of K-12 spending - is twice as high now as it was ten years ago. In between, there was a major spike due to the American Recovery and Reinvestment Act. In theory, that money should have tapered off by now; officially it has, but there is an amount lingering that appears to have become permanent. We can see this effect in the share of federal money in total state spending (see Figure 1 below). Other Funds, again, include but are not limited to capital outlays. In some states, regular spending that in theory should fall under the General Fund, is routed through Other Funds. The reasons for this vary, but in Colorado this habit grew out of the voter approval of the Taxpayers' Bill of Rights (TABOR) in 1992. Since TABOR puts a constitutional restriction on state spending increases, it would have been a major hurdle for the legislature. However, it only applies to the General Fund, allowing for a re-routing of spending through Other Funds. 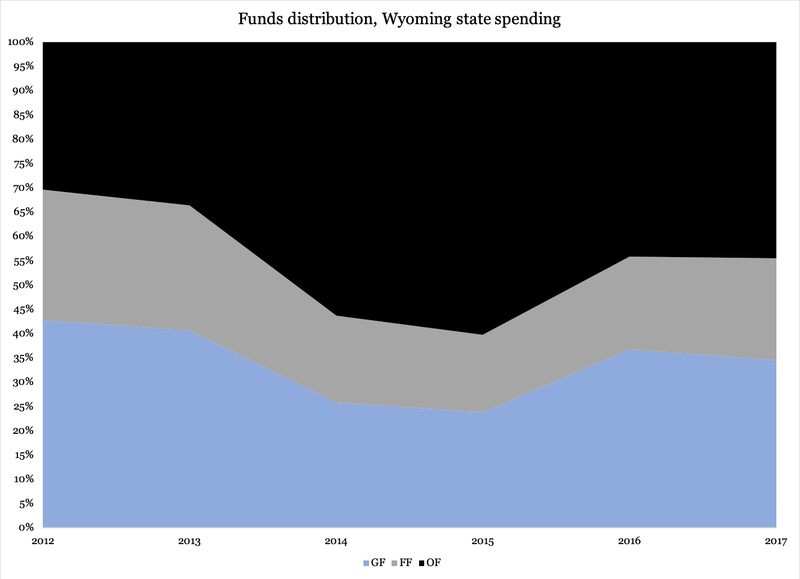 The changes in the three funds of Wyoming state spending make for an interesting trend. Over the past ten years, the General Fund has declined from representing 63 percent of total outlays in 2008 to an estimated 35 percent in 2018. Federal Funds are now 21 percent of total state spending, compared to less than ten percent in 2008, leaving 44 percent to Other Funds (up from 27 percent a decade ago). The more money we route through Other Funds, and the more dependent we become on federal money, the less transparent our state budget process becomes. Next week's installment will take a closer look at how the state of Wyoming documents its budget - and its spending.